I combined two of Dandy Mott's favorites – caramel corn and...blood, into one tasty American Horror Story inspired treat – Blood Soaked Caramel Corn. 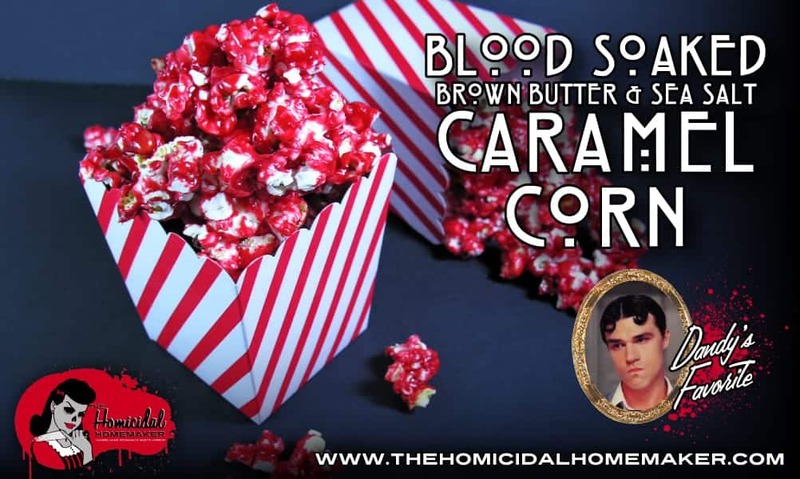 Dandy’s Favorite – Blood Soaked Caramel Corn! It’s finally here! The new year and the much-anticipated return of American Horror Story “Freak Show” on FX! I’ve missed watching it over the holiday season, and to celebrate it’s return, I decided to share a quick and easy treat that you can put together in about 15 minutes! 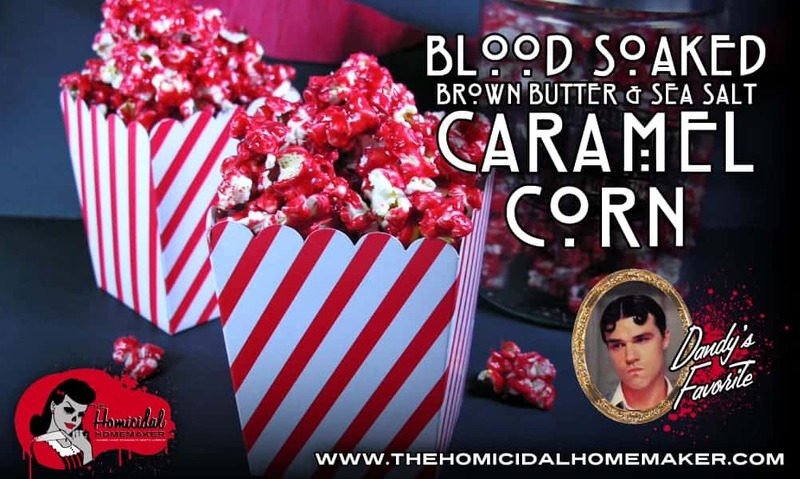 So I combined two of his favorites – caramel corn, and, well…blood – into one tasty American Horror Story inspired treat – Blood Soaked Caramel Corn. The caramel sauce from start to finish only takes about 10 minutes to prepare, and all you need to do is pour it over your popcorn, toss to coat, and allow to set up for about 5 minutes. Make a batch to enjoy while watching the mid-season premiere of American Horror Story “Freak Show”! Pop your popcorn, and pour into a large bowl. Set aside. If browning butter –In a light-colored medium sauce pan, melt butter over medium heat. Stir constantly until butter begins to bubble and foam. Watch closely! When butter becomes fragrant and a light brown color, immediately turn off heat and pour butter into a heat proof dish and allow to cool slightly. In the same saucepan, add brown sugar and corn syrup and cook on medium high heat until sugar is melted. Add browned butter to the mixture, and allow to come to a boil. Add your sweetened condensed milk and sea salt. If not browning butter – Cook brown sugar, butter, and corn syrup in a medium saucepan over medium-high heat, stirring constantly. Allow the mixture to come to a boil, and then add sweetened condensed milk and sea salt. Allow mixture to come to a soft boil for about 4 minutes. Don’t let it burn! Remove from heat, and add in vanilla extract and red paste food coloring. Mix until combined. Pour caramel sauce over the popped popcorn and mix with a wooden spoon until evenly coated. Spread mixture onto wax paper until cooled (about 5 minutes). Break any large pieces apart, and enjoy!